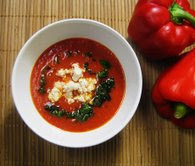 Helen made us a Smoky, Sweet & Spicy Red Pepper Soup topped with crumbly feta and minty oil. The peppers, tomatoes and garlic were roasted until a little charred, for extra flavour. It was a clear favourite and way out in front, in our voting poll! Well done Helen! Here is your winner's badge. i missed the challenge this month, but was actually wondering if red pepper makes a good soup yesterday! this looks great....I will be in the next group, I promise. I also promise to highlight you specifically on my blog this week too! hope things are going well! Nice to hear from you. I bet things have been crazy there for you. Things are going fine here, the weeks are just flying by. I can't believe it is now April! Helen's soup does look gorgeous, doesn't it? yay! I'm so happy that everyone liked my soup! Thanks to everyone for voting. I'm looking forward to the next round! Perfect Pick Holler! This is so fun! No, a worthy winner, looks superb! Hi Helen, it was a mighty fine soup! Hi Deb, I am glad you are enjoying the challenge! Well I won't vote for it Pixie! I can't imagine anything more vile! Very nice roundup! What impresses me about the winner is the simplicity and few ingredients in her soup. From viewing your two No Croutons Required roundups I have come to realize that I take the "kitchen sink" approach to soup. My first entry for vegetarian soup had 17 ingredients and my entry for this roundup had a whopping 25! All of my soup recipes have at least 12 ingredients. I almost didn't recognize you! Cute new avatar photo! Thanks Lisarene, I had a lot of stick about my previous photo from family and friends, so I decided it was time for a change! I thought your spicy vegetable soup look really tasty! But I look forward to seeing the result of your change of tactics!